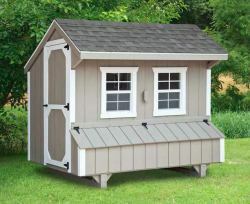 Animal owners, check out the high-quality sheds and structures you can buy from us at Amish By Design. Chicken coops: Your chicken can’t produce high-quality eggs or meat if they’re unhealthy or exposed to the elements. With a handcrafted chicken coop from Amish by Design, you can ensure that your chickens remain healthy and safe in a cozy indoor environment. We offer our clients a wide range of styles in chicken coops as well as optional features to make it easier to care for your birds. Some of these choices include litter trays, nesting boxes, and roosts. Each of our chicken coops comes equipped with a roofing shield to help keep your birds cool in the summer and warm in the winter. Keeping your chickens safe in a coop prevents other animals from getting in and attacking them or leaving a mess for you to clean up. It also prevents inter-breeding with other types of birds. When you purchase a coop for your chicken from a local store, there’s a high likelihood it went through an impersonal process of mass production. At Amish by Design, you have the reassurance of knowing that each product we sell has been carefully crafted by hand. This ensures the highest quality and attention to detail with each chicken coop as well as our other farm products. We invite you to contact us at the location nearest you. We have three locations in Virginia, including Hanover, Stafford / Fredericksburg, and King George. Dog kennels: A dog is a wonderful companion as well as a big responsibility. You can’t simply let your dog wander around your property or the property of your neighbors. He or she could engage in destructive digging, barking, or other unwanted behavior. On the other hand, dogs have a lot of energy and you can’t exactly keep them in the house all the time. When you’re not available to supervise your dog outside, placing him or her in a dog kennel made by Amish by Design is the next best thing. 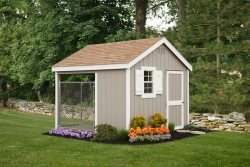 Our dog kennels look more like tiny homes than a place to keep a dog enclosed. We provide you with several options to ensure that you choose the safest and most comfortable kennel for your four-legged friend. Flap doors and chained-in porches are two choices especially popular with our customers. We also offer numerous style options. Your best friend deserves a customized kennel made by hand. That is exactly what he or she will receive when you work with Amish by Design to create the perfect dog kennel. We invite you to contact usto discuss what you’re looking for in a dog kennel and how we can help. For the convenience of our customers, we maintain locations in Hanover, Stafford / Fredericksburg, and King George, Virginia. Horse barns: Just like dogs and chickens, horses need ongoing protection from the elements. Wind, rain, hot sun, or even occasional snow can make your horses uncomfortable. Each of your horses needs an individual stall to prevent aggression between horses and provide them with privacy. A horse barn also keeps other animals out that could bother or injury your horse, such as birds and snakes. A horse barn does more than provide a home for horses. It’s also the place that you store brushes, tack, feed, and other equipment needed to care for each one of your horses individually. Storing these items inside of your horse barn ensures that they remain safe from the elements and other animals as well. 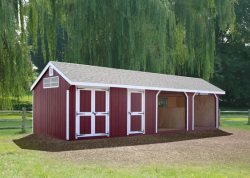 We are happy to customize your horse barn so you have separate spaces for equipment. At Amish by Design, we don’t think it’s an overstatement to say that we produce the highest quality of horse barns in the entire region. The reason for this is that our builders create each one by hand according to the specifications of the buyer. We also offer free home delivery in the local area for all horse barns and larger items as a convenience to our customers. Feel free to ontact us at the location nearest you to learn more. 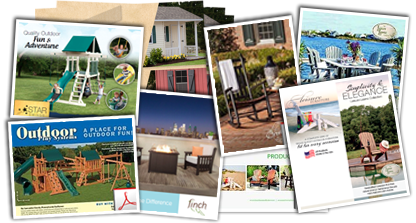 Amish by Design has three locations in Virginia. We also encourage you to read one of our many five-star reviews from other happy customers!